Spots on the feet are unsightly and might be uncomfortable. They are usually black or brown, may have raised bumps, or have grainy areas that are rough to the touch. Sometimes these spots are caused by illnesses or medical conditions, which is why it is vital to see a doctor for any new spots that appear on the feet. In some cases, the dark spots on the bottom of feet might be as simple as a mole or age spots. But occasionally the dark spots can be a sign of a more serious condition. Here are a few of them. Plantar warts often appear on the feet as a consequence of the human papillomavirus, or HPV. You can contract the virus through tiny breaks in the skin. It can be picked up in locker rooms, public showers, swimming areas, or other warm and moist places. You can contract it by simply walking barefoot in public – one person can spread it anywhere, and if you walk in that same area, you can catch it. In addition, if you scratch the warts and then shake someone’s hand or otherwise come in contact with others, that’s enough to spread the virus. Minor surgery is usually done in the doctor’s office, with a recovery time of a few weeks. Topical acids cure the warts over a long period of time but don’t hinder any activities. Laser surgery is used to remove larger warts, which is usually done only if the warts are significant. Cryotherapy, or freezing the warts off the foot with liquid nitrogen is not painful, and the wart falls off within a week or so. During treatment, it is very important to avoid swimming or walking around barefoot, as that can spread the virus to others. Dark spots on bottom of feet caused by tinea nigra are attributed to a skin infection. The infection is caused by fungi; though there are several different types of fungi that can cause it, the most common one is Phaeoannellomyces werneckii. As the fungi invade the skin, they eat the melanin, which creates skin pigmentation. The result is a concentrated black spot where the fungi invaded. Those who work with soil are more likely to develop the problem. The gardeners or landscape workers should always wear thick shoes and gloves. Treatment for dark spots on bottom of foot caused by tinea nigra is usually a very simple topical cream. The antifungal ingredients include ketoconazole, miconazole, clotrimazole and terbinafine. Treatment takes usually two to four weeks; however, tough infections might need up to eight weeks to clear. For those who want to speed up the healing, the doctor can scrape the area with a scalpel to allow the medication to better penetrate into the skin. Oral medications are usually not recommended. 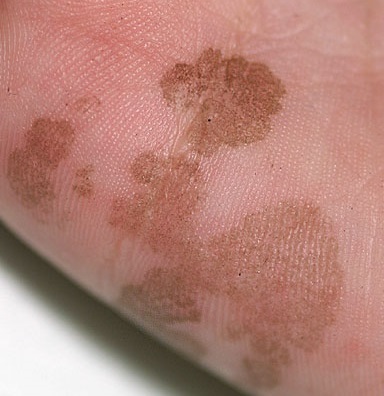 In extreme case, the dark spots on the sole of foot is a sign of melanoma. 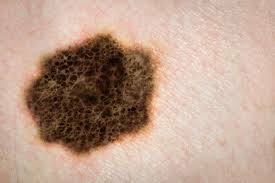 Melanoma is an aggressive cancer that begins in the cells that produce skin pigmentation. People of all ages can fall victim to melanoma. Unfortunately, many cases of melanoma go unnoticed during the early stages, and that results in diagnosis at a later stage when treatment is much more difficult. It is very important to inspect your skin for signs of darkening. The spots of melanoma have the following characteristics. Dark spots on bottom of foot can be caused by other problems as well. Diabetic dermopathy, often associated with high blood sugar levels, creates a problem with blood vessels in the skin. This can lead to oval and circular brown spots; these don’t produce any pain. On the other hand, dark spots might also be caused by excess insulin. Another cause might be purpura. Those with the condition are more prone to bruising and bleeding. Athlete’s foot, a common fungal infection, might also lead to dark spots on bottom of feet for some individuals. On a more serious note, arsenic poisoning can often present as dark spots on the skin. No matter what the reason for the dark spots is, it is a good idea to see a dermatologist for assessment and treatment.